I will admit no one was more shocked then me by how much I loved Scarlet. The book is written in dialect which is usually the kiss of death for me, and I have no prior knowledge, except the Disney movie, of the Robin Hood mythos. So, color me surprised, when I couldn’t put Scarlet down. Understandably, I went in to Lady Thief with some trepidation. So many series suffer from second-book syndrome, where the first is amazing and the second merely fills a gap from the first to the third books. 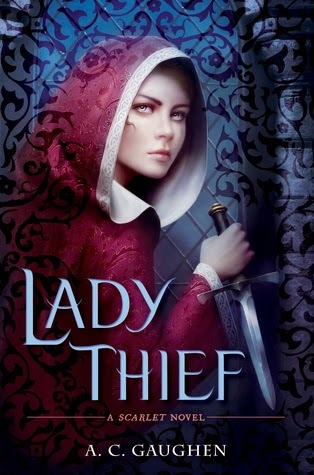 Luckily Lady Thief does not suffer from second-book syndrome and I ended up loving it just as much as the first! At the end of Scarlet the sheriff had been murdered and who was going to be the new sheriff was still a mystery. Lady Thief begins with Prince John’s arrival to Nottingham and his decision to hold a tournament which will determine who the new Sheriff will be. I love Scarlet. She is the entire reason I love this series so much. Scarlet isn’t playing at being a badass, she just is. The more I learned about her upbringing and history the more enamored I became with her story. Lord Gisbourne was someone I hated in the first book. He was a great villain. My one main complaint is that in Lady Thief it felt like he became a completely different person. In Scarlet, Gisbourne was all swords out, scarring faces, killing people. In this story he was a very different man. It was a strange change of events and almost…almost had me feeling bad for Gisbourne. Overall, Lady Thief was a great sequel to Scarlet. And that ending left me desperate for the third book! I have a feeling it is going to be a long wait. !!! I didn't read your review because I am waiting to read this but I am thrilled that you gave it 5! I LOVED Scarlet so I am looking forward to this. I'm anxiously waiting to read this. Though, I might have to re-read Scarlet just because it's been a while. I'm so glad it's still as wonderful as the first book!